Habitat/Location: Anywhere there is darkness and prey. Description: With many names, these foul creatures are truly terrors undying. 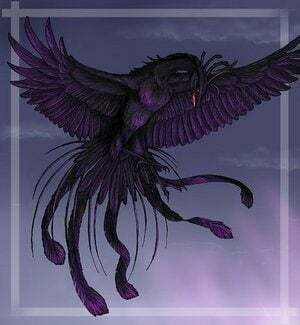 Blood Birds, Shadow Ravens, Dark Flame Phoenixes, these monstrosities are thankfully rare. The once brilliant flames of the Phoenix's bird form burn black and cold after the foul transformation. With their new undead power they are reborn from the ashes of a dark flame, they lose their memories and skills, but retain their unholy thirst, unable to transform into human form like a normal phoenix. With no knowledge on how to restrain themselves they attack the nearest living creature. A single beast can ruin an areas wild life over several nights, as it is reborn with a fresh hunger each night after the sun slays it come morning. Should this monster find its way into a town, the destruction would be unimaginable.